Some of you may have seen the screen shot of Easton's latest ad for its Haven range last week. Well the official press release just showed up along with this informative little video as well. I've copied in all the info but much like when the Havoc switched to a 35mm bar clamp and wider, the bar got stiffer. Well that is indeed the case here; a switch to 35mm for the Haven bar clamp as well as an additional 40mm on the total width of the bar and both the carbon and alloy bars comes in almost at the same weight as their narrower predecessors. And the good news for all you handlebar luddites out there that resist change, is that the 31.8mm bar has gotten wider to a more respectable 740mm. The all-new Haven 35 Carbon bar combines the proven 35-millimeter clamp diameter of the market leading Havoc 35 Carbon and combines it with a more accessible 750-millimeter width. This is the perfect handlebar for aggressive trail riders and enduro racers. Because of the bulked up centre section we managed to decrease the weight while making the bar wider and stronger. The most impressive attributes are the strength and ride quality—Thanks in part to a premium blend of ultra tough composite material that’s ride tuned for the perfect balance of stiffness and damping. Nine-degree sweep and 5-degree upsweep put your hands in the ideal positions for attacking the trail and there are two rise options. And let’s not overlook aesthetics—this handlebar features a sleek, matte black unidirectional carbon finish with a variety of colourful graphics to match your bike. Available in 35mm clamp diameter with two rise options and four colourways. The Haven 35 Aluminum handlebar is the enduro / All Mountain answer. This bar is incredibly light (270-grams), plenty wide (750-millimeters) and incredibly strong. Not to mention its sleek aesthetics perfectly match the rest of your ride. The Haven 35 Aluminum handlebar, much like the rest of the group, was designed to help trail riders roll faster and fly farther. Exclusive TaperWallTM technology allows the use of the minimum amount of material necessary without harming overall strength and durability. Available in 35mm clamp diameter and four color ways. The Haven Carbon has long been the cornerstone of our enduro / All Mountain handlebar line. This season, the popular handlebar grows from 711- to 740-millimeters and only gains 25 grams! But the minimal weight is only half of the beauty of the Haven Carbon. The most impressive attributes are the strength, stiffness and durability. 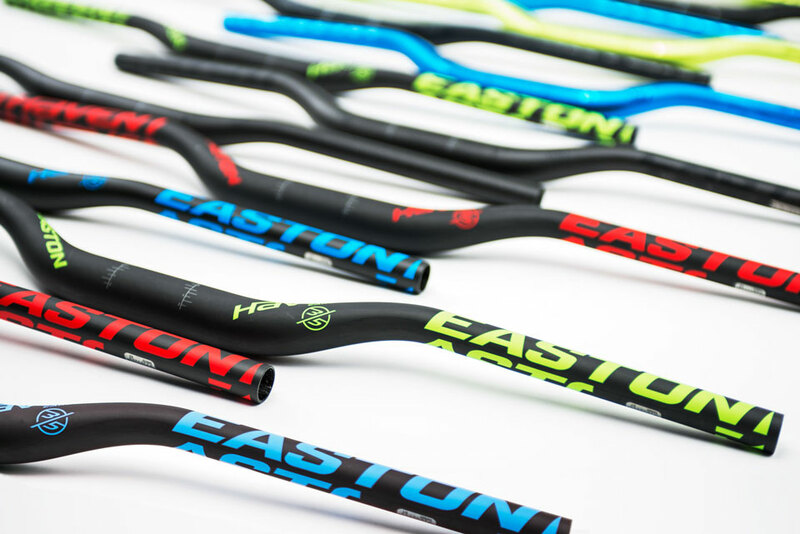 Easton’s classic handlebar geometry—9-degree sweep and 5-degree upsweep—puts your hands in the perfect positions for attacking the trail and the low, 20-millimeter rise complements the tall front-ends of modern trail bikes. And this handlebar will make any bike look better with its sleek, matte black unidirectional carbon finish and three color options. The Haven Aluminum is an easy answer. This bar is incredibly light (285 grams), plenty wide (740-millimeters) and incredibly strong. Not to mention its sleek aesthetics perfectly match the rest of your ride. The Haven Aluminum handlebar, much like the rest of the group, was designed to help enduro riders roll faster and fly farther. Exclusive TaperWallTM technology allows the use of the minimum amount of material necessary without harming overall strength and durability. We took our most popular mountain bike stem and made it bigger and better. The new Haven 35 stem is lighter, stronger and stiffer than ever before. Best of all, the wide range of sizes (including the super-short 40mm option) give 35mm handlebar users the options they’ve been looking for. Classic, go-to enduro/All Mountain stem. This original Haven stem is one of the components that established Easton as the premier option for aggressive trail riding. This fully CNC machined alloy stem features an impressive stiffness-to-weight ratio, Distributed Stress and Top Lock Technologies. If you have a Haven bar, this stem is the perfect match. The Haven stem is available in four sizes (55-, 70-, 85- and 100-millime- ter lengths) and two sleek colors.